Many people have a strong appreciation for gargoyles as an art form as well as their dominant presence as an architectural design element. The fact that they are the primary decorative feature of so many historically important buildings is fascinating. There is always an interesting story behind each individual gargoyle and how it became a significant component of these structures. From the Ellis County Courthouse in Texas, to the canyons of New York City and all across Europe, these creations have captured the attention of people for centuries. The creators of Gable Gargoyles produced such a piece for their own enjoyment. The goal was to incorporate these endearing creatures into the family home in a way that truly represents the original intent and traditional location of gargoyles and grotesques, from a prominent place, high above their domain. The rooftop gable was the most unique, desirable and challenging choice. When others saw this, the usual reaction was, “I want one, too.” The response was beyond expectation and demand grew. That led to the formation of The Gable Gargoyle Company and the birth of an entrepreneur. While we realize that gargoyles are not suited to everyone’s tastes, the people that admire them tend to really, really like them. This idea and this site are dedicated to those fellow spirits who appreciate these creatures and would gladly become a keeper of their own gargoyle to protect loved ones, adorn their dwelling, and diligently watch over their realm. Our mission is simple: to provide the best products and service to our customers. We take great pride in our company, our commitment to customer service and in the products we sell. Our online store is designed to provide you with a safe and secure environment to browse our product catalog. While we gratefully accept financial compensation, our greatest reward, by far, is a completely satisfied and happy customer. Please do not hesitate to share your story, suggestions, comments, or photos with us. 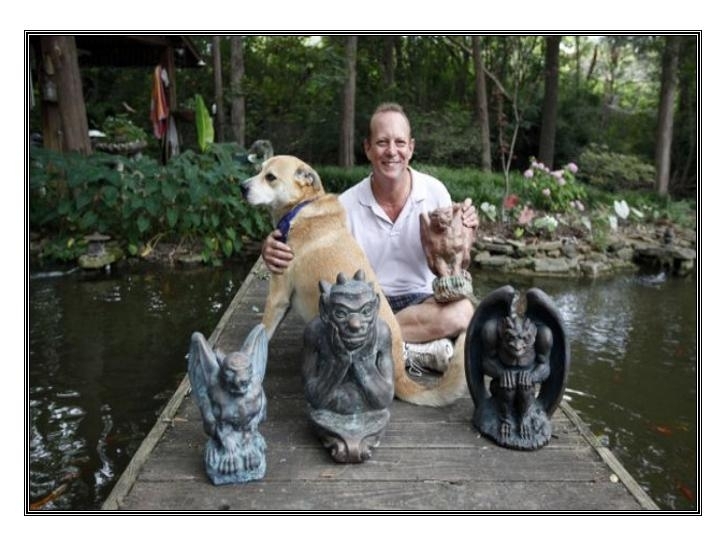 GABLE GARGOYLE COMPANY was recently featured in The Dallas Morning News and ADVOCATE MAGAZINE. There’s something roosting on top of Mark and D’Nell Sherbet’s East Dallas house. Fortunately, it’s not a flying rodent or a wayward heron stalking the koi. It’s a gargoyle, and its presence helps keep the home free of evil spirits — or at least makes it stand out in the neighborhood. Locally, the Sherbets found gargoyles on the Ellis County Courthouse in Waxahachie and one perched on the Old Red Courthouse (1890) in downtown Dallas. When Sherbet looked for a gargoyle of his own, he couldn’t find one to mount on a gable roof. He experimented with a small table-like universal mounting base that can be affixed easily to any roof crest. “The gargoyle sits on the plinth and the plinth rests across the gable,” Sherbet says. The Gable Gargoyle Co. currently offers three styles: Herman the Guardian, Felix the Watchful and the Spitting Gargoyle of Notre Dame, loosely patterned after the famed Gothic landmark on the Île de la Cité. Sherbet notes that the figures are more accurately called grotesques, because they don’t involve water. Technically, a gargoyle is a decorative waterspout that preserves architectural stonework by diverting rainwater away from it. Grotesques fancifully depict humans or animals, and they serve ornamental architectural functions, such as corbel or capital. “We use ‘gargoyle’ because it’s the name people are more familiar with,” Sherbet says. The figures are made from Portland cement mixed with water and poured into a latex mold. When unmolded, the gargoyles continue to harden and cure. Penny Ruekberg is a Richardson freelance writer.